Mie Nagai volunteers with the Japan Cat Network in the Fukushima Exclusion Zone. Each week, volunteers drive into the Zone, feeding abandoned cats and dogs left behind when their owners evacuated from Namie town. Some cats are brought back to a shelter in Inawashiro where the group searches for people to adopt them. 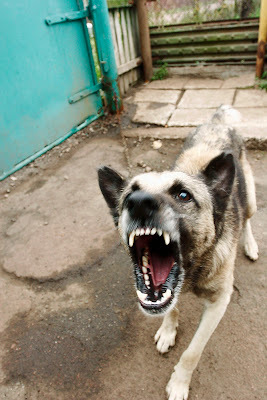 After Chernobyl, they shot dogs. Soldiers went around to abandoned villages, killing pets and guard dogs to prevent them from spreading radiation or rabies. After Fukushima, they feed the dogs. And cats. Several different non-profits travel through the empty villages outside the Exclusion Zone; some have temporary permission to enter the 30-Kilometer Zone to feed or catch strays. 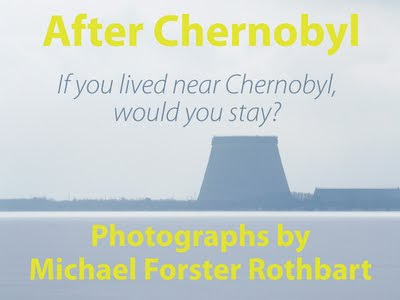 During my time in Chernobyl and Fukushima, I heard a lot of unbelievable stories. Some of them impossible, some improbable, yet many of them true. It happens during any disaster: reports contradict, rumors fly, official statements don’t mesh with personal experiences. It’s clear why this happens. In a crisis, the situation changes constantly. News agencies scramble to tell what they know, piecemeal, because no one yet has the big picture. Government officials mislead or are just poorly informed. Even the eyewitnesses have selective memories, clouded by fear and adrenaline. Then the gossip starts, hyperbolic, opinionated, pointing fingers. Before long a consensus story emerges, but there is little reason to trust it, built as it is on assumptions and half-truths. Now, two years later, these beliefs start to congeal into history, accurate or not. It’s a wonder we ever know anything about anything. Here is one tale I heard repeatedly in Fukushima. I haven’t been able to confirm it, but it fascinates me. I share it with the caveat that it may be false. In many evacuated places in Fukushima Prefecture, the story goes, residents were not required to leave. They were advised to evacuate but never forced. Since Japanese culture esteems social harmony and conformity, I was told, most people did whatever was asked, or what their neighbors did, and left. In contrast, in Ukraine, some residents fought to stay. Ordered by the police and military to evacuate, many refused. Over 2,000 villagers snuck back into the Chernobyl Exclusion Zone and have lived the remainder of their lives there. 1. After the Chernobyl accident, conscripts removed radioactive debris using nothing more than shovels and wheelbarrows. 2. People steal radioactive radiators from the Chernobyl zone to sell for scrap metal. 3. Last month, a section of roof at the Chernobyl plant collapsed due to heavy snow. Answers Monday. Tomorrow: what is dangerous? Returning from the Fukushima Exclusion Zone one day, I meet Hiroshi Watanabe outside the train station. I watch with fascination as he straightens each bike in the bike parking lot where he works. Wearing white gloves, he moves very precisely: he measures a distance with his shoes, then grabs the next bike and stands it parallel with the previous one, tall and evenly spaced. The phrase ‘rearranging the deck chairs on the Titanic’ keeps popping into my mind as I photograph Watanabe. This isn’t really fair, I admit, since Fukushima City is not about to sink. But why does the municipality spend money on parallel parking of bikes while people remain in crisis mode nearby and so many evacuees' needs go unmet? The answer, I think, is that the psychological effects of a disaster travel further and less predictably than the physical ones. 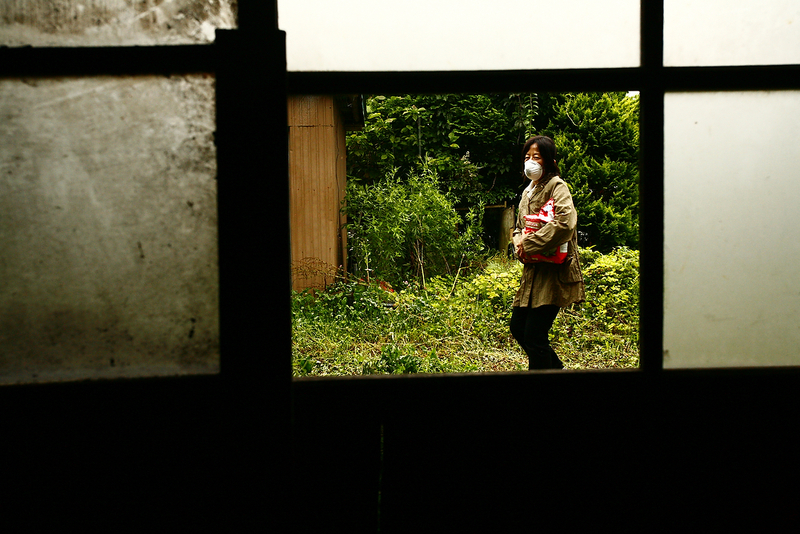 The residents of Fukushima—whether directly affected by the earthquake or not—crave normalcy. They want reassurance that Things Are As They Should Be. (See interesting commentary here). In the U.S., we would never notice a chaotic bike rack, but in Japan, it’s just not right. Watching Watanabe reminds me of a woman I met in Ukraine whose job is gardener at the Chernobyl plant. She maintains window boxes, planters and a big beautiful rose garden outside the main building entrance. Seems crazy, I know. But after all, if you work there, you want Chernobyl to look neat and attractive for visitors, don’t you? 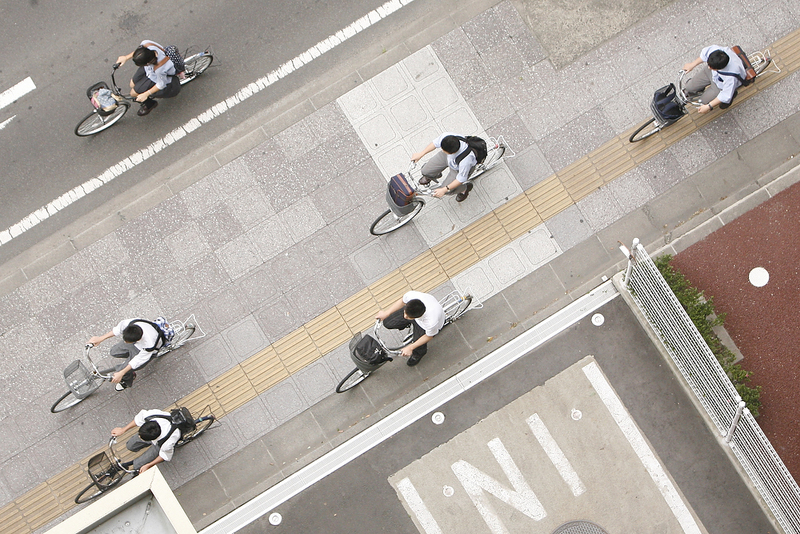 Students and workers commute to school and work through Sakaemachi neighborhood in downtown Fukushima City. The post-apocalyptic is not immediately obvious in Fukushima City. You may be disappointed but I am not surprised. One evening, I exit the Fukushima train station into East Fukushima Square, past the old men sitting on a bus stop bench smoking cigarettes, past schoolgirls pushing their bikes and the swirls of starlings among the treetops. I walk past the Freshness Burger stand and past the casino belching 80s pop music and the chimes and dings of slots machines. Past the Mr. Donuts shop with the free sample donut holes on the front counter. Across from my hotel, I duck into a 7–11 to get some sushi. Everywhere, people are out enjoying the summer evening. Fukushima Prefecture has a total population of nearly 2 million. Yes, 1,817 people were killed or missing here after the earthquake and tsunami (1) and yes, about 150,000 remain displaced by the tsunami and nuclear disaster (2) including some 30,000 to 60,000 who have left the province entirely (3, 4). 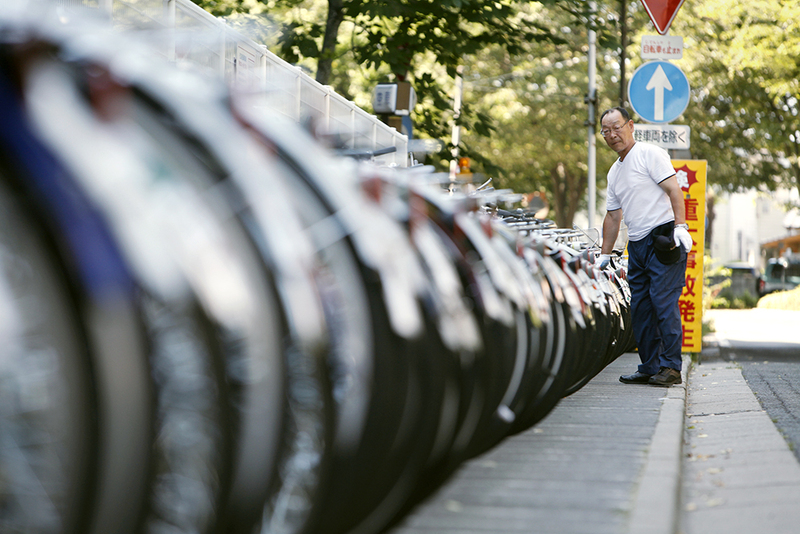 Nevertheless, the city still has 290,000 residents going about their business. Consider that the city is 35 miles—over winding mountain roads—from the tsunami-wrecked coast, and 52 miles from the nuclear power plant. It’s only from afar that Fukushima Prefecture, Fukushima city and Fukushima Daiichi seem synonymous. After any disaster, there are three groups of people: the dead, those whose lives will never be the same, and those who are eager to return to normalcy. That line between victim and bystander can be razor-thin. Some who had close calls want to help, while others shrug and move on. Consider an example closer to home. In NYC the week after Hurricane Sandy, the people of Far Rockaway, Queens, were flooded out of their homes. Fifteen miles away in Brooklyn, people used flashlights and recharged phones from shared extension cords, while in midtown Manhattan, life sailed on unperturbed. Now five months later, Rockaway residents are still dealing with mold and FEMA. In Brooklyn they have good stories to tell, and in Manhattan, if anything, they get miffed about subway delays. Fukushima City is a place trying hard to find the new normal. You can find signs of the disaster but you must know where to look. Here and there are public dosimeters announcing the current radiation level the way a bank thermometer shows the temperature. Here is a woman wearing a mask and gloves while she weeds. Over there is an overgrown highway shoulder which municipal workers have refused to mow. Here, a vacant lot where an earthquake-damaged building was torn down. Sources: (1) National Police Agency of Japan, (2) Asahi Shimbun, (3) Yomiuri Shimbun, (4) NYTimes. 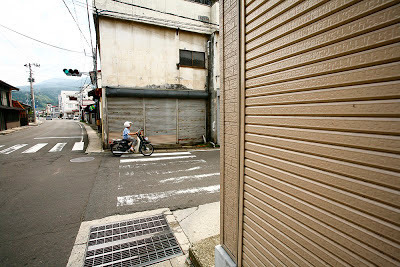 Almost all the shops are closed in the village of Harimichi, the streets nearly empty. Harimichi (in Towa town, Nihonmatsu district) has not been officially evacuated. It is fifteen miles west of the Fukushima Exclusion Zone. Nevertheless, most residents have left, afraid of radiation. The public school was closed for the year due to suddenly low enrollment. Many times as I passed through Harimichi, going into the Zone, the gas station was the only business open. I made a point to buy gas there—it seemed the least I could do. Evacuees. Most evacuees were permanently displaced. The boundaries of the four different zones have changed over the years. A few evacuees later returned home; others were not relocated until a several years after the accident. Residents of contaminated areas. Of course, radiation does not end at the edge of the Exclusion Zone, and those living nearby still experience low levels of radiation. Invalids—that is, people disabled or made ill due to the radiation. Liquidators—the workers (mostly men) conscripted or who volunteered to decontaminate the nuclear plant and surrounding territory. The children of the above categories, some of whom have serious health problems. In my After Chernobyl project I added one more group who do not receive benefits (but do earn higher wages): Current Chernobyl workers, both those employed at the Chernobyl plant and those working in the Exclusion Zone. Any individual’s actual exposure to radiation is unknowable. So for a bureaucracy, these categories serve as a practical but arbitrary way to group victims. I found these classifications a useful framework for understanding stories from Chernobyl. In Japan I heard the same kinds of stories — like evacuee Kaori Sekine, still living in temporary housing, and farmer Kazuo Nakamura who can’t find anyone to buy his rice. In later posts I’ll tell more of these personal stories. 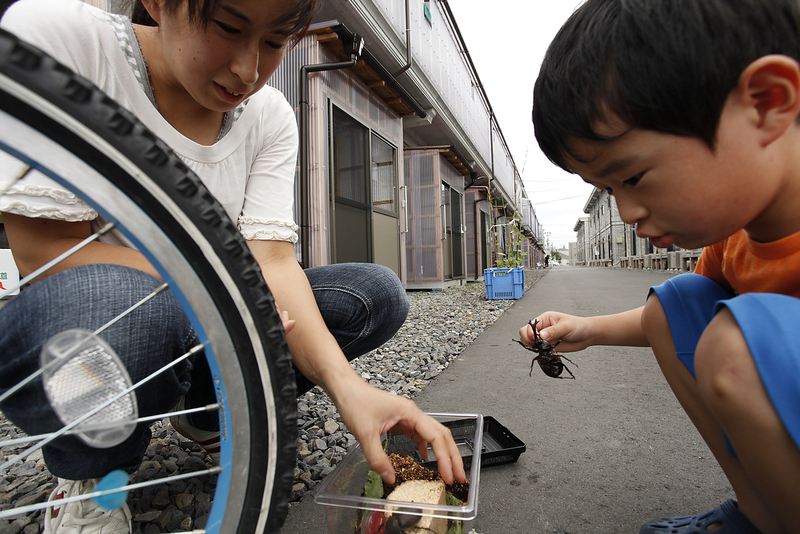 Tomorrow: life goes on in Fukushima city. Yasuko Hamabata lives in Tokyo, but for a year and a half she has worried about her exposure to radiation from Fukushima Daiichi. During a trip to Fukushima city, she goes to the Citizens’ Radioactive Measurement Station—a privately-run radiation detection lab in a downtown mall—to have her dosage measured. To understand the impacts the 3.11 disaster has had on Japan, I think it's first important to consider the three-part nature of what happened and where. First the earthquake destroyed buildings all over central Japan — over a million buildings collapsed or were damaged (1). But in most places, of course, the damage was disparate, some buildings destroyed while neighbors were fine. Then, in the next hour, the tsunami wiped out the east coast of central Japan, especially a 420 mile stretch of coastline, up to six miles inland (2). After that, the Fukushima Daiichi meltdown started the first day and continued for a month (or thousands of years, depending on your perspective), most affecting people within 20 miles but extending northwest from the plant in a plume. 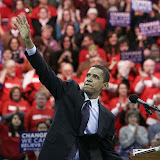 Now think of the consequences: loss of life and family, property, community, employment, health, psychological health. Compared to the deaths (18,549 killed or missing) and physical destruction from the tsunami, to some the radiation seems secondary. But here is the critical issue: when your home gets washed away, the damage you see is immediate and obvious. When you are hit by radiation, the consequences are never so clear. It's all a game of probabilities. How much? How dangerous? How soon will it affect me? As I saw in Chernobyl, this uncertainty is maddening for survivors of such a disaster, and the answers to many many questions never come. Tomorrow: different ways radiation affects people. Sources: (1) National Police Agency of Japan, (2) Bloomberg. Today I'm thinking of all my friends in Fukushima. Today is the second anniversary of Japan's 3.11 Earthquake and the disaster at Fukushima Daiichi nuclear power plant. I spent three weeks in Fukushima last year. For the next 2 weeks I will share a photo a day from my new After Fukushima project. 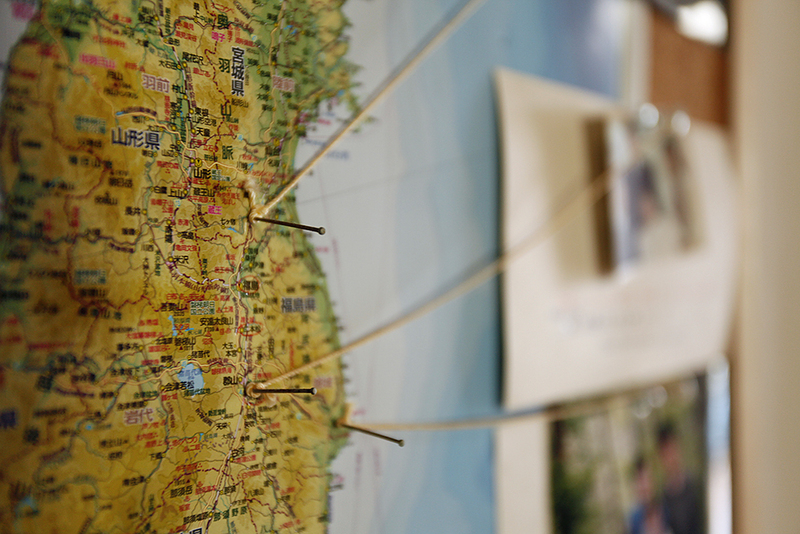 A map of Fukushima Prefecture hangs in the lobby of the Koriyama Baptist Church. Photos attached to nails mark the hometowns of friends of the church, some of whom have moved away. 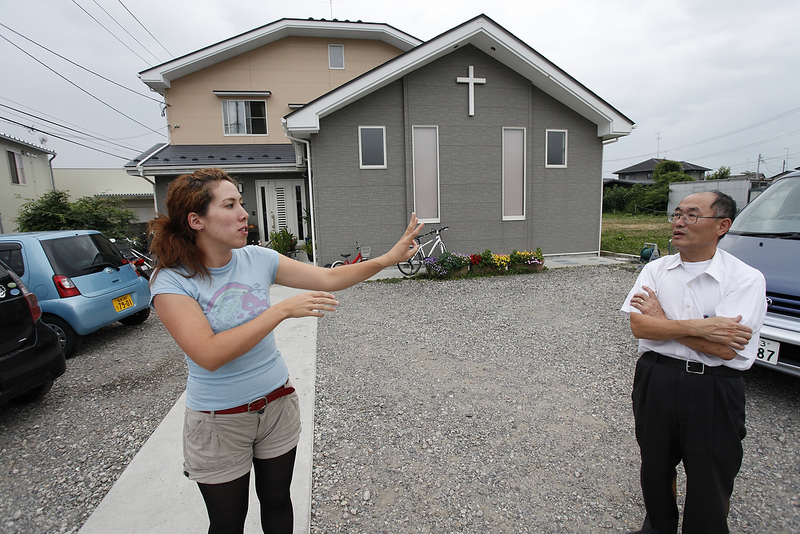 Japanese-American pastor Nobumasa Tajima runs the church with his wife Beverly. The Tajimas lead weekly trips to temporary shelters still housing evacuees from the 3.11 earthquake. “In Japan, people don’t do charity work except after a disaster. We bring people food. But they don’t need food. They need comfort,” says Nobumasa Tajima. While we're looking at a map, here's some quick geography: Fukushima Prefecture (province) is in central Japan. The Fukushima Daiichi nuclear power plant is on the east coast (center of this photo), in a region of small fishing and farming towns, 160 miles north of Tokyo and 67 miles south of Sendai. The border of the Evacuation Zone now ranges from 6 to 35 miles from the Fukushima Daiichi, but does not extend as far as the three major cities of the province (marked with nails above, from N to S), Fukushima City, Koriyama and Iwaki, 32 to 50 miles away. The estimates of evacuees still displaced vary widely, from 150,000 to 300,000, while each of the three major cities have populations of 300,000 or more. SOURCES: Japan Road Atlas (Shobunsha), Google maps, NY Times, Asahi Shimbun. Exhibit, symposium, movie, book, photos! Oh my! 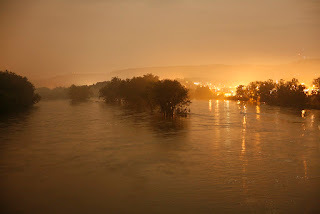 The Susquehanna River, viewed at night from the Route 201 bridge in Vestal, NY, remained well above flood stage 4 days after it flooded in September 2011 following Hurricane Irene and Tropical Storm Lee. Some of my photos from Hurricane Irene and Tropical Storm Lee (published in the book Flood 2011) are in the exhibit Mighty Susquehanna: Friend and Foe, opening at the Vestal Museum (near Binghamton, NY) on March 10, 1-3 pm. Exhibit runs through May 25. March 11 is the second anniversary of Japan's 3.11 earthquake. Each day this week I'll post a new Fukushima photo on my blog and Facebook page. My photos from Fukushima will be screened at the University of Hawaii, part of the symposium Japan After 3.11: Change and Hope from the Center of Triple Disasters. March 10, 2 to 4:30 pm at the Center for Korean Studies Auditorium at UH Manoa. Details here. My brother Davy premieres his new documentary film Medora this week at SXSW. Screenings March 10, 12, 14. Schedule here. Blurb.com invited me to be one of the photographers featured in their new Designer Collection. The release date for my blurb After Chernobyl book is March 13. FINALLY, the biggest news I can't tell you yet. Look for an announcement here later this month about my exciting project due out in July.